This is one of those mystery lilies. Alan Mitchell of Scotland reported when he forwarded these two photos, "It�s obviously related to Lilium taliense, but the flower colour and darker leaf colour makes me wonder if it�s an intermediate form between L. taliense and L. lijiangense, which varies from almost spotless bright yellow to very heavily spotted dull yellow. However, that�s pure speculation". L. jinfushanense Peng & Wang 1986. Found growing in forests in SE Sichuan, Nanchuan Xian at 1800 to 2200 m. The Board of Trustees, Royal Botanic Gardens, Kew have sited Gao, Y.D. & Gao, X.F.�(2014). 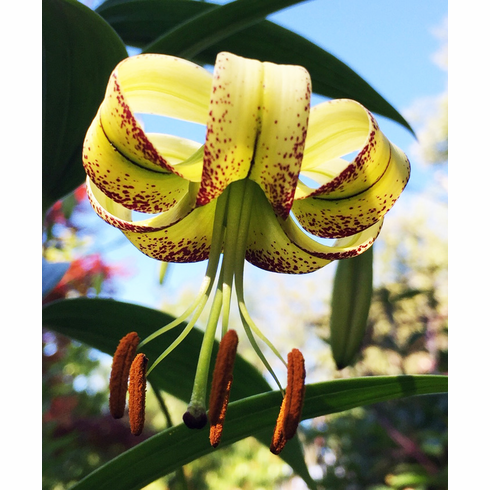 Taxonomic notes on Chinese Lilium which says L. jinfashanense is justified as being a synoymy for L. talense (Franchet) by demonstrating the existence of continuous morphological variation which they observed in the field and among herbarium specimens. Is it a true species or a variant of L. taliense or an intermediate form between L. taliense and L. lijiangense, only time and a great deal of study will tell. Title photo and insert courtesy of and copyright Alan Mitchell, all rights reserved. Used with permission.